For those of you who appreciate Arcade Slots as well as the more standard online slot machines, Pop Bingo should give you a reason to wave a brief goodbye to the paylines and reels for a few minutes at least. It won’t have escaped anyone’s attention just how popular Bingo is currently – websites abound where aficionados can wile away their time electronically daubing the squares in the hope of making a line, a full house or some other custom shape on the card. 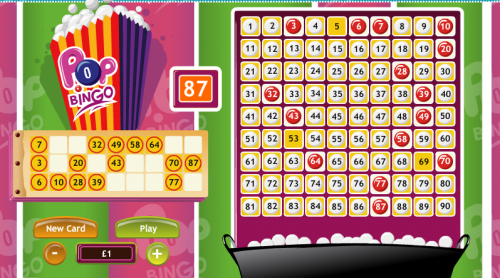 Bingo is a pretty effortless, automated game but Pop Bingo manages to make it even less work somehow but it does introduce a clever way of calculating your winnings. We’ll describe the game screen to start with and on the left hand side we have the bingo card for the current game underneath a large bag of popcorn; below the card are a couple of options to swap the card for some new numbers and to alter your stake. On the right of the screen is a 10 x 9 grid featuring the numbers 1 – 90 but it’s at the top of the screen where the interesting stuff is – it’s a decreasing scale of winnings with each win marked by a certain number of ‘pop’. Pops in this case are the number of balls which are drawn and you can see this chart below. It’s pretty simple really and it’s all automated; once you select the stake amount and press the ‘play’ button, balls will fly up from the bottom of the screen and start to cover numbers on the grid. There’s no interaction required here and all you do is hope that the balls will cover the numbers which match the numbers on your card on the left hand side. As you can see from the chart, if you can complete your card in 40 ‘pops’ or less you’ll win 10000x your stake; any more than 88 ‘pops’ and you’ll win nothing. That’s all there is to it and like we said above, it removes all the effort from what is a fairly effortless game to begin with. It’s a good diversion from the slots, even if only for a few minutes. On a final note it’s worth noting that if you spend the maximum stake of £100, an incredible £1m win is possible.